Be a Part of Team ENERGY STAR and Help Save the Climate! Team ENERGY STAR launches today and I could not be more excited to be a part of the team. And guess what my green friend? 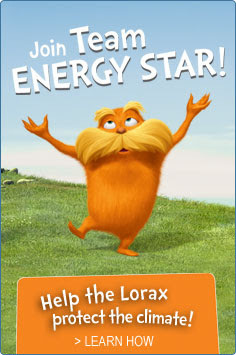 You, your green family and even your eco-kids can easily be a part of Team ENERGY STAR and start speaking to the trees with the Lorax and me. Team ENERGY STAR is the eco-inititaive from the U.S. Environmental Protection Agency’s (EPA) ENERGY STAR program which is celebrating 20 years of helping consumers save nearly $230 billion on utility bills - all while preventing more than 1.7 billion metric tons of greenhouse gas emissions. The eco-friendly, kid friendly and family friendly Team ENERGY STAR initiative was developed to engage and educate American youth and their families about saving energy in our homes and it is going to be a lot of fun! Did you know that about 70% of the electricity we use comes from power plants burning fossil fuels? Burning fossil fuels causes greenhouse gas emissions that contribute to climate change. In fact, according to EPA, the average house is responsible for more than 25,000 pounds of greenhouse gas emissions per year which is about twice as much as the average car. Using energy-efficient products and practices reduces the amount of carbon pollution added to the atmosphere and can lessen the effects of climate change. In 2011 alone, Americans, with the help of ENERGY STAR, saved enough energy to avoid greenhouse gas emissions equivalent to those from 41 million cars! Team ENERGY STAR ingeniously empowers both adults and kids to help protect the climate through easy-to-implement, money-saving actions and provides our next eco-generation with an outlet for sharing their passion for preserving our environment. And, with Dr. Seuss’ the Lorax as the engaging theme and teammate for Team ENERGY STAR, kids can learn and have fun at the same time. My 6 year old is flipping out at the prospect of working with the Lorax and Dr. Seuss to help save our environment and I am excited to have an eco-inititave to share with my growing, green kids. Take the Team ENERGY STAR Pledge - Challenge yourself and your family members to make changes big and small as you work to protect the climate with ENERGY STAR. You will even get some help along the way with promotions offered by ENERGY STAR partners across the country and in your neck of the woods. If every American household took the actions found in the Change the World, Start with ENERGY STAR Pledge, we would save more than126 billion KWh/year of electricity and save $18 billion in annual energy costs. We would prevent greenhouse gases equivalent to the emissions from 20 million cars. .
Inspire Others by Sharing Your Story - Grab the family and create your very own eco- video to share what you and your family do to save energy. Upload your viedo to the interactive map and your story will be showcased online and through social media. No worries if you don't have a video camera, upload a picture and you will be on the map too. Check Out the Map - Find helpful resources and events across the country and in your own back yard to help give you local support on your energy saving journey. 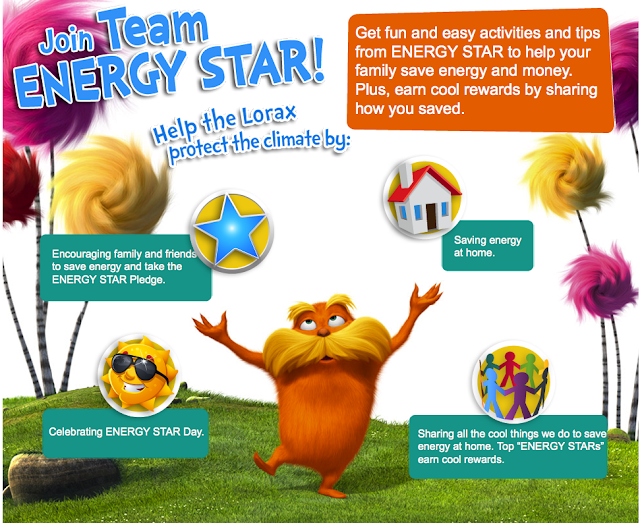 Join Team ENERGY STAR Online - This is where the eco-fun happens for the kids and they can show the world that even the youngest among us can hekp save the climate just like the Lorax urges us too. They can even share their story about protecting the environemnt to save our climate to earn a place on the interactive ENERGY STAR map. Kids will get easy-to-download educational and interactive materials, like a comprehensive Action Kit, the ENERGY STAR Home Check-Up, a Lorax activity booklet and a Lorax mustache-making kit. Can I wait to take part in the fun with my kids? Uh no, I cannot. 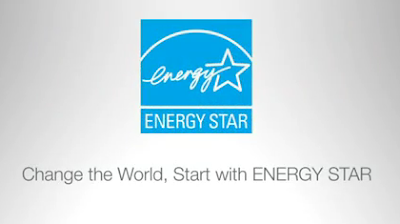 Team ENERGY STAR is part of a multi-year EPA campaign called Change the World, Start with ENERGY STAR. It was developed to engage Americans of all ages in saving energy, money and protecting the environment with ENERGY STAR. Millions of people are getting involved and joining their neighbors in this grassroots movement to help protect the climate by saving energy. Join us. This is going to be fun to change the world together. Check out my friend Diane MacEachern, from Big Green Purse, and her awesome carnival of posts from the incredible group of bloggers who support energy efficiency and Team ENERGY STAR.